Sarafina Tafoya (1863-1949), circa 1920-2. “space” can be viewed as the clay area removed from the surface to create deeply carved imagery. 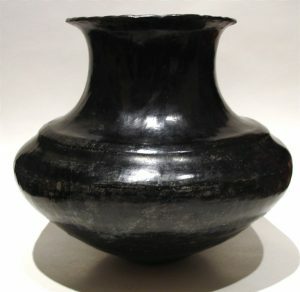 The “space between” denotes the larger time period of the generations of potters who have taken this technique in new directions. 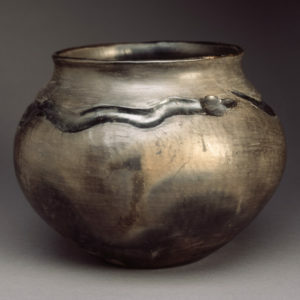 Margaret Tafoya (1901-2004) expounded on the idea and techniques of carved pottery and her grandson, Nathan Youngblood (b. 1954) has furthered the genre with his own creative ideas. 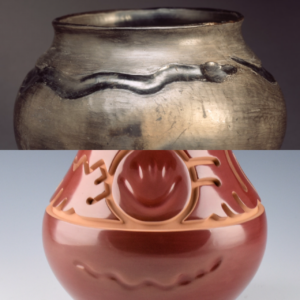 Today, “The Space Between” also becomes a reflection of Nathan looking back for inspiration at the early carved work of his great-grandmother (Sarafina) and other early Santa Clara Pueblo potters. With the centenary of these first carved vessels approaching, it’s the perfect time to pursue a better understanding of the history surrounding their initial creation. 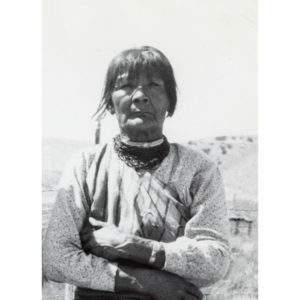 Santa Clara Pueblo had a small, mostly agrarian population of 264 in 1910 and 242 in 1920. Pottery at this time was made by women and it was either red or black in coloration. The pieces were thin-walled and the surfaces were typically fully stone burnished. 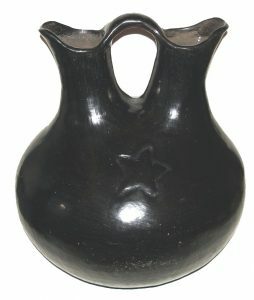 While some were made for utilitarian or ceremonial use in the home or village, much of it was made for sale. The pottery was primarily sold in Santa Fe or Taos, and through businesses like the Fred Harvey Company which disseminated pottery across the US. 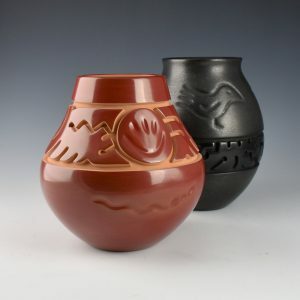 Water jar by Sarafina Tafoya with a rainbow ridge on the shoulder and and raindrop rim. “The symbol most directly associated with Sara Fina is the bear paw, which has been used on Santa Clara pottery since at least 1200 ad (Peterson 1997, 55). Its use comes from an old legend: during a time of drought at the pueblo, a bear led the people to a freshwater spring and saved them. 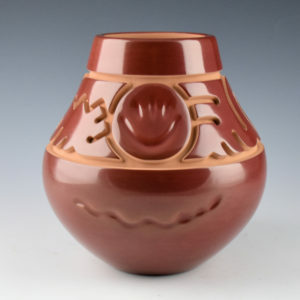 Sarafina Tafoya water jar with impressed bear paw and ‘raindrop’ rim. As Margaret explained it, “The bear always knows where the water is, and this is a design we put on the water jar, the storage jar, the wedding vase” (New Mexico Governor’s Award, press release, 1986). 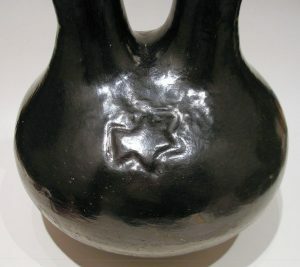 This symbol has deep significance within the Tafoya family, and it is only put on vessels that could store or carry water as a sign of remembrance. It is a family tradition that the matriarch of the family makes the largest bear paws on her vessels. In each generation, the first daughter in the family to make a storage jar would be the one to have the largest bear paw when her mother passed away. This would then be passed down through her lineage.” (Born of Fire). Double Shoulder Water Jar made by Margaret Tafoya & Sarafina Tafoya. their work. Overall, these designs were not specific imagery, but simple enhancements of the form. That was about to change. 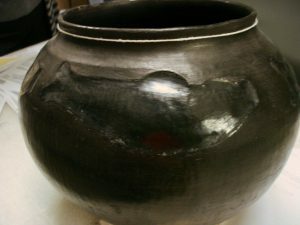 One of the “Original Twelve” carved jars by Sarafina Tafoya. These first twelve carved vessels are an important transition in the art. They are fully designed images, no longer just accents to the form. They are cognitive, in that they are each designed to match the shape of the vessel and tell a visual story. As Nathan Youngblood expressed when he saw one of these pieces, “They are the ‘missing link’. They are the link which brings us from simple geometric patterns to fully carved and designed work.”. While it has been noted that Sarafina made twelve of these pieces between 1922-4, not all of them are currently located. I have come across at least five which were either collected at the time from Sarafina or are strongly attributed to her work. They each have a similar design technique and impressed carving style. The design concepts are such a dramatic departure for the time that their identification is much easier for attribution once they are seen. 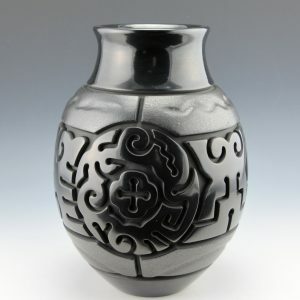 One of the “Original Twelve” carved jars by Sarafina Tafoya. Water jar with impressed birds and raindrop rim. What do they look like? Two of the pieces have a snake or water serpent. There is a water jar with a bird and a wedding vase with a dog (?) and star, and there is a jar with fish. These are no longer just geometric shapes on a vessel, but actual figurative impressions. It is interesting that most of the shapes are varied but the style of carving remains the same on each piece. It is enticing to imagine what the other pieces look like, or if they have survived! 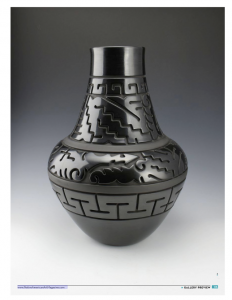 One of the “Original Twelve” carved jars by Sarafina Tafoya. 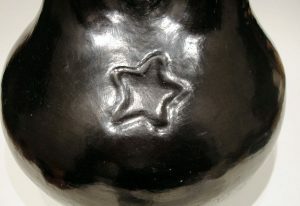 Star Design on one side of the wedding vase. 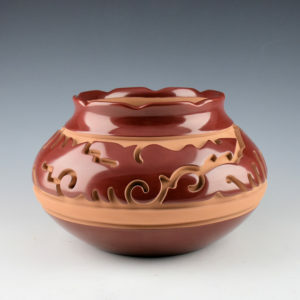 One of the “Original Twelve” carved jars by Sarafina Tafoya. Possibly a dog design on the opposite side. 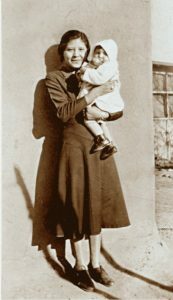 Margaret Tafoya holding Virginia Ebelacker, late 1920’s. Geronimo, and later Margaret’s husband, Alcario, marketed her pottery.” (Born of Fire). In contrast, San Ildefonso potters Maria Martinez and Tonita Roybal were traveling the country to various World Fairs and Expositions. Sarafina and Margaret stayed close to the Pueblo. All these factors acting together could easily have reduced interest in the sales and promotion of ‘another innovative style” at this time when there already were so many new additions to the oeuvre. 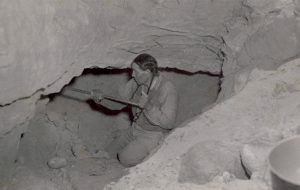 Alcario Tafoya (the husband of Margaret Tafoya) digging clay at Santa Clara Pueblo. in the past. It now required thicker coils to create structural integrity in the vessels. This certainly seems the case as there is a point around 1930 when there is a noticeable change in the clay used in Santa Clara pottery. Together, these two events may have been an impetus for Santa Clara potters to seek a new style to generate sales. The earlier impressed pieces by Sarafina would certainly have been remembered by her and the family. It was not necessary to create something new, but simply refine what she had done less than a decade earlier. Thicker clay simultaneously allowed for deeper carving. Earlier use of designs such as the avanyu (water serpent) and imagery created for the painted pottery, would have been easily transferred to the new carved ware. 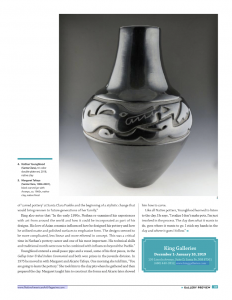 The “new” carved pottery now found a voice in the clay and an interest among collectors. 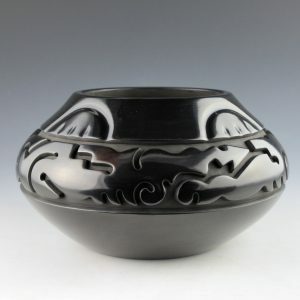 Between 1930 and 1990, Margaret Tafoya would become one of the great names in Santa Clara carved pottery. She would pass this legacy on to her children, grandchildren and future descendants. Nathan Youngblood jars inspired by the work of Sarafina Tafoya. opportunity to personally examine the pieces. It is the shapes which initially inspired Nathan. But the forms are only half the story and the early designs and how and where they are used add to the relevance of his search. He has created a new body of work taking inspiration from these pieces from his Pueblo’s past and specifically the work of his great-grandmother Sarafina. 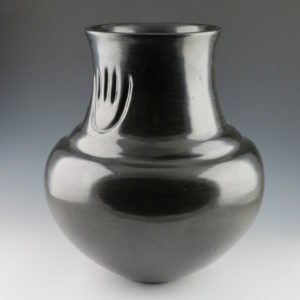 Nathan Youngblood jar with “raindrop rim” and deeply carved avanyu. 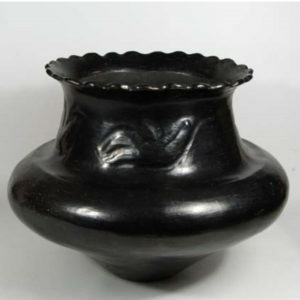 In addition to culture and technique, Nathan also views the pottery through the lens of being a scion of this great family. 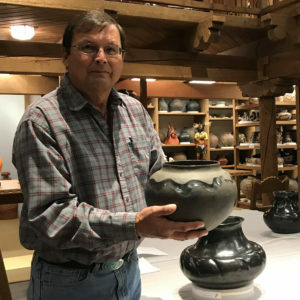 When viewing the work at SAR and asked about the personal impact of holding these historic pieces he said, “I think about what that was potter doing. What was going on in their life at that time? What influenced them in their personal lives, or in the Pueblo, that would make them think to make such dramatic design changes. They were remarkable”. Today, Nathan is creating a distinctive series of twelve pieces directly inspired by these important historic works. It is less a revival of shape or design than a projection of the past through the lens of his creativity and expressed in the clay. His new works fills in some of the gap of “The Space Between” the past and present and provide a provocative look at how much has changed in less than a century! As the new pieces in this series are finished, they will be added to this page. 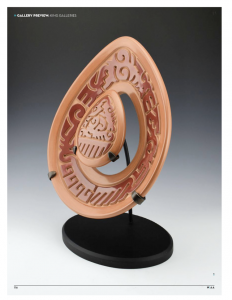 It will be fascinating to see where the history, culture, and research take him and combine with his dynamic carved and highly polished clay art. 1. 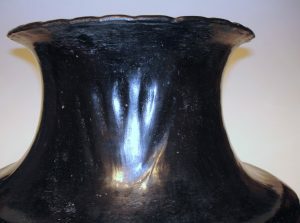 Wide bowl with carved cloud and rain designs above the shoulder. 2. Water jar with carved avanyu in four panels around the shoulder and four rain clouds near the base. 3. 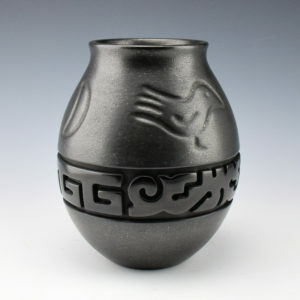 Water Jar with a bear paw medallion and a carved water serpent below the shoulder. Thanks to the Museum of Indian Art and Culture and the School of Advanced Research for allowing us to research in their collections. 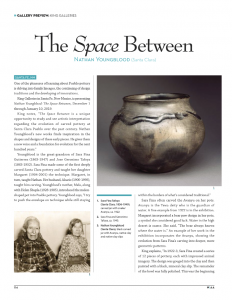 Thanks to Native Art Magazine for their brief article, “The Space Between” in the Dec/Jan 2018/9 Issue.